The first step to getting a quote for your laser cut metal parts is uploading the necessary files. You can choose between a DXF and any other file type. DXF is the preferred option, as this format can be used for automatic price calculation. We have written an instruction how to produce drawings that are ready for manufacturing, so just following that will get you to a quotation. In short, you have to avoid anything but cutting lines. So simple is better. Another article provides a list of free CAD software to make your drawings, if you don’t already have one. You can determine everything in our menu – material, thickness and quantity. If you need extra operations, like bending, certain tolerances or surface treatment, just provide your instructions in the written box, enclose a PDF drawing or add a STP file for bending. You can choose a material with the right properties for your need. Our online laser cutting tool gives you prices for structural steel, stainless steel, aluminium etc. The material selection is available in the drop-down menu. The same applies to material thicknesses. We have sheet metal (up to 6mm) as well as plates (above 6 mm). If the menu doesn’t include what you are looking for, ask for a quote manually. We may still have it. If you have uploaded multiple drawings, you can assign the materials in bulk. Just tick the boxes in front of the details that the same parameters apply to. If the thickness and material is uniform within all parts, you can just check the “select all” box before assigning them. This way you can easily save some time. As the drawings should not include any dimensions, we have included the general dimensions of each part on the ordering form. It is just next to the material selection drop-down menu. You can use it to check if you got your drawing’s scale right. After selecting the material, you can determine the needed quantity. All the while, our algorithm is calculating on the side and updating cost according to inputs. The displayed price applies to laser cutting only. If you have any specifications, please add them to the commentary section. There is also the option to add a PDF drawing to show threaded holes and the like. In that case, just confirm the offer and ask for an invoice. We will send you an updated offer in a short notice. If you only need laser cutting and the price is suitable, you can confirm and pay straight away. The next step is filling in the address. After you click “proceed to checkout”, you are asked to fill in your shipping details. Those are linked with your account. Therefore, there is no need to refill it every time you place an order. You can also add numerous different addresses, so you can quickly select the right one from the existing database, if your company has more than one warehouse. If all is correct so far, the “proceed to payment” button appears. From there, you are presented with options for payment. Those vary by country and we are constantly adding new ways to allow different possibilities for paying. All for the convenience of our customers. After the payment is done, our algorithm selects the best suited manufacturer from a list of partners. They are located all over Europe, so we can keep the lead times short and at the same time, have a variety of competency at our disposal. Some manufacturers are experts at aluminium cutting, others may be better with stainless steel. Quality is our main focus. This wide selection also gives us the possibility to go for the best price – sometimes you can get the quickest and cheapest service by shipping the parts from overseas. We have given out instructions to our partners to make sure that the packaging is nice and tidy. Our customers have given great feedback on this because pallet-loads of scrambled parts make for a headache. 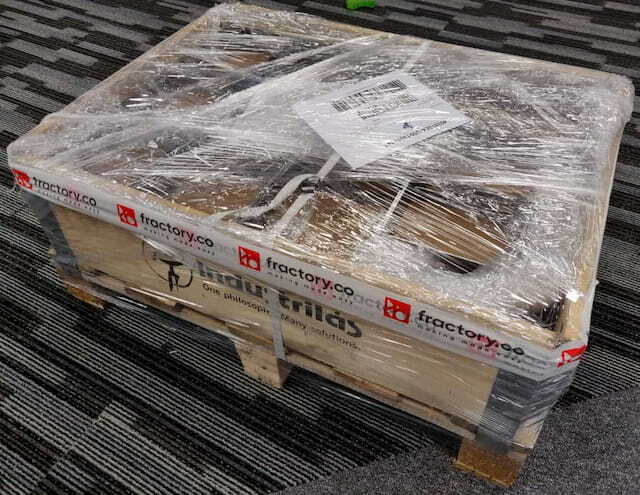 Having everything nicely packed with the right documentation to go makes for an easier life on the production floors. 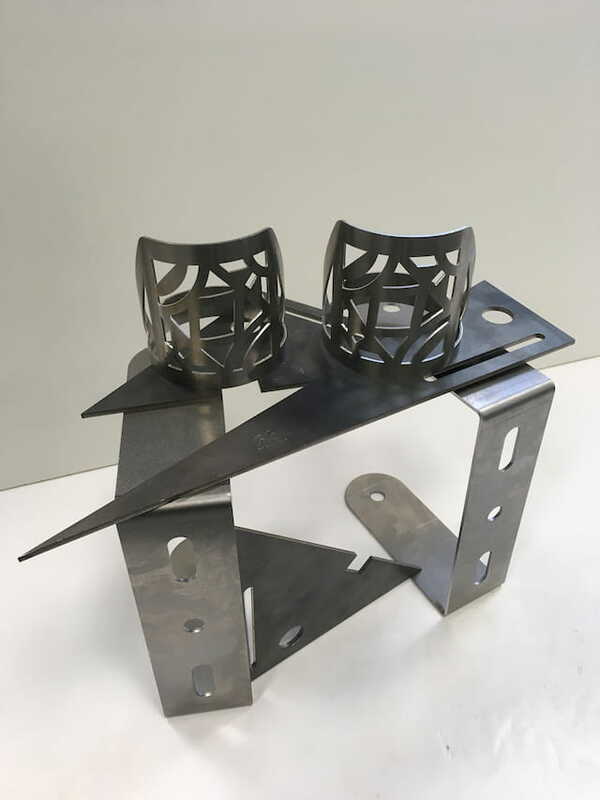 Our online laser cutting service does not impose geographic limitations. As said, we have partners all over the world. We have delivered parts to the UK, the USA, the Baltics, Scandinavia etc. You just have to provide an address and we take care of the rest. Again, standards apply to our carrier partners. This means that you can expect your parts in a good condition, even if they have travelled a long distance to land on your doorstep. We don’t limit ourselves to only sheet metal laser cutting. We also offer plasma cutting, bending, tube cutting and surface treatment. Although these operations are not yet fully automated, you can send in your requests manually. Fractory.co sales engineers will answer you shortly.